You can redirect visitors directly to gated content (i.e., your content offer that can come in the form of a PDF or video), or a thank you page containing your content offer, after they submit your HubSpot form. Learn more about creating a HubSpot form. Create your offer page that has a form for visitors to submit for the content offer. If you have a Marketing Hub Professional, Enterprise, or Legacy Marketing Hub Basic subscription, or the CMS add-on, you can create a page as an offer page. Choose a template with a form module to set up your form on the page and if it is a limited offer, expire the page after a certain date. Create your content offer and upload it to a server. Once uploaded, note the URL of the content for the redirect. If you have a paid Marketing Hub subscription, you can upload the content to your HubSpot file manager and get the content URL. Create a thank you page. If you have a Marketing Hub Professional, Enterprise, or Legacy Marketing Hub Basic subscription, or the CMS add-on, you can create a landing page as a thank you page. For your visitors to access the gated content after submitting the form and arriving on your thank you page, add a link to your content on the page. Please note: to reduce the likelihood of visitors entering your thank you page and accessing your content offer without submitting the form, consider blocking the thank you page from search engines. In your HubSpot account, navigate to your landing pages or website pages, depending on where you created your offer page. Hover over the offer page and click Edit. In the left panel, What will a visitor see after submitting your form? section, click Redirect to another page. Click the Redirect link dropdown menu. To redirect the visitor to your content, click add Add external link. 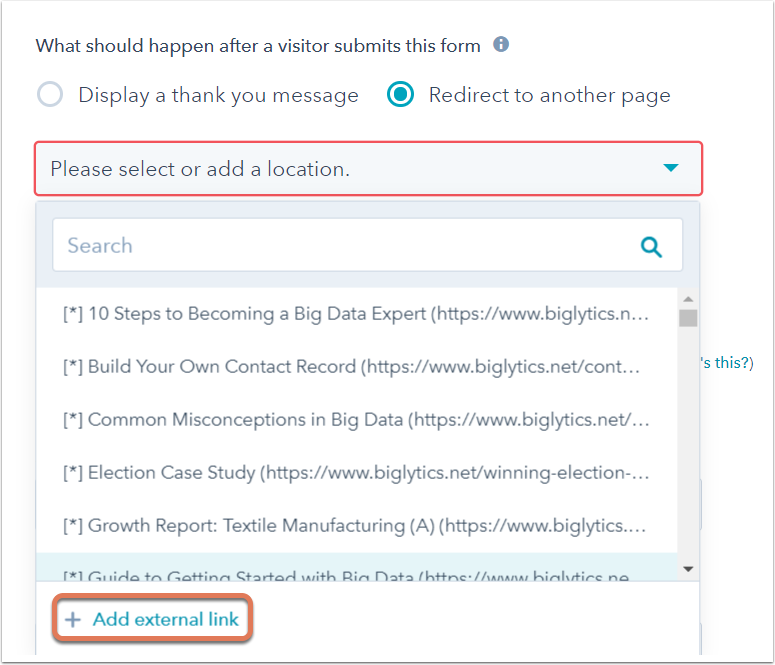 In the dialog box, enter the content URL, then click OK.
To redirect the visitor to your thank page that is hosted on HubSpot, search and click the page. To redirect the visitor to an external thank you page, click add Add external link. In the dialog box, enter the page URL, then click OK. In the left panel, click Save and go to module list. Learn more about embedding your HubSpot form on an external page. Under What should happen when a visitor submits this form, select Redirect to another page. Click the Please select or add a location dropdown menu. To redirect the visitor to your content, click add Add external link. In the dialog box, enter the content URL, then click Add. To redirect the visitor to an external thank you page, click add Add external link. In the dialog box, enter the page URL, then click Add.